The earliest ancestor of Edward William Butler that I have been able to trace is his great, great, great great grandfather, Edward Butler who married Deborah Vicares in 1681. Edward has been a popular name in this branch of the Butler family: of the eleven generations down to the latest Butler in this line, Lincoln Edward, son of my brother Paul Edward, there have been eight whose names include Edward. Edward William’s other Butler ancestors are Edward Butler and Deborah Vicares’ son Joseph Butler (b.4 October.1694) who married Mary Spilsbury, 23 November 1720. Their son Edward John Butler (b.1736) married Mary Austin. Their son Edward Butler (b.1766) married Elizabeth Hammond Bishop 28 July 1794. It was their son Alexander Bishop Butler, (b.1828), married to Charlotte Selina Mortimer 13 September 1827, who migrated to Tasmania arriving per the Derwent, 9 January 1838. Their son Alexander Edward Butler (b.1828) married Eliza Helyar 8 April 1852. Their son Edward William Butler (b.1864) married Lilian McLean 29 December 1897. It is this couple who are the subjects of this chapter. Their son Malcolm George Butler (b.1907) married Honor Whittaker 26 September 1936. These are the parents of Paul, Adele and myself. Their eldest son Paul Edward Butler (b.1937) married Robyn Chater in 1964. Their only son is Michael Edward Butler (b.1972), the father of Lincoln Edward Butler (b.2011). The full account of Edward William’s ancestry is found in the chapter on Alexander Bishop Butler. The full account of Lilian McLean’s ancestry is told in the chapters on the Dedicoats and the McLeans. Edward William Butler and Lilian McLean. Two very striking people these: he unfashionably bald at thirty-three and looking into the distance, she twenty-three and untimely dead at thirty-five but imperiously lovely; he the grandson of a London gunsmith, she the granddaughter of a convict-bushranger gunsmith. Their wedding photos are separate affairs: their daughter Julia said he would not have their photo taken together lest she outshine him. The two photos show them separately in their going-away outfits: lovely, proud people. Edward William Alfred Butler was born at Jan Juc, on his father’s farm, into the practised hands of Nurse Grundy, 14 February 1864, and his birth was registered at Richmond with which his family had strong links. Those early years must have paralleled those of his family: a few more years at Jan Juc, several more children, and a return to Melbourne in 1869 where we may presume he grew up along conventional lines in a home of many children, with a father who held a responsible public position in Richmond – and that ever present spectre of the nineteenth century, the death of children. Edward William was presumably a member of a band, for there is a picture of him in a uniform, holding a piccolo; and his brother Frederick was, it seems, a kind of boy scout, a member of the Star of Richmond Juvenile Tent. The children must have been given many educational opportunities in their growing up. 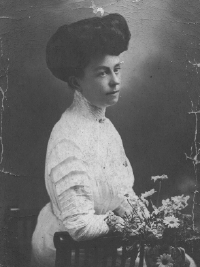 In 1886 Edward married Jessie Hilda Burke in Melbourne. He was twenty-two years of age. There was one son, Alexander Edward, named after his grandfather Butler, and he died a bachelor 29 January 1964. 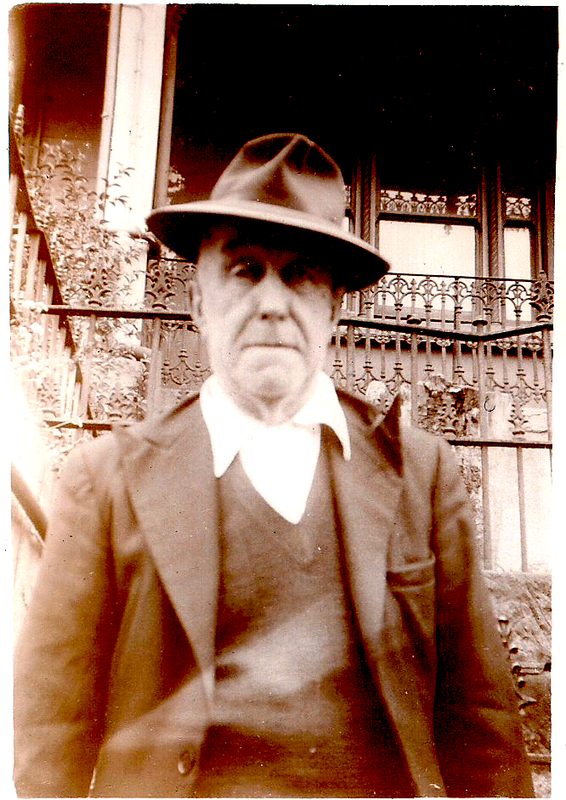 There is a photo of him taken at his father’s funeral in 1928 but no more is known about him: my father never spoke of him, and my aunt mentioned him, to my surprise, only when I began asking about the family in 1971. As for Jessie Hilda Burke I gather she was “put away quietly” because she did not quite please Edward William: I trust the story and my memory have not done the couple an injustice: there is more to this story than I currently know. It was in 1893 that Alexander Edward senior moved to Sydney, apparently with his sons Edward, Hubert and Percy. 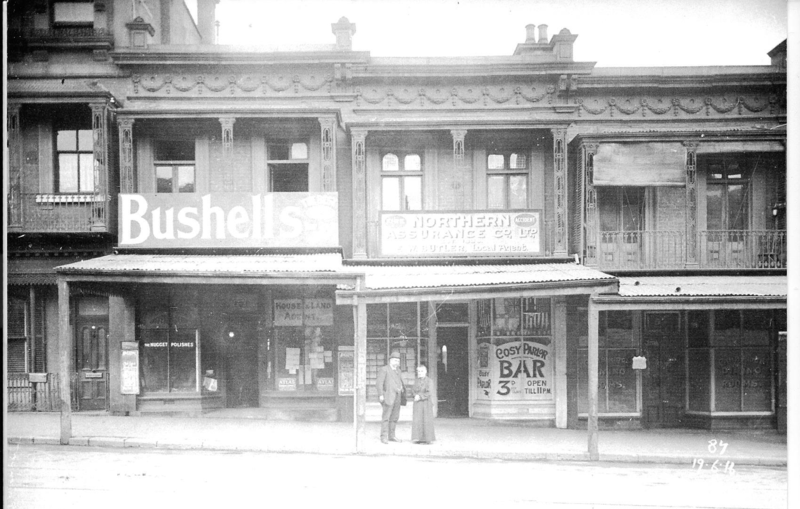 They stayed for a time at 13 Brisbane Street, which runs off Oxford Street into Hunt Street, Surry Hills. They were later established with Alexander Edward in partnership as estate agents in Glenmore Road, Paddington, in 1896. In 1897 Edward William set up as a house agent at 99 William Street and in that same year remarried. On his marriage certificate of 29 December 1897 he was described as a bachelor – not quite accurate. The wedding took place at 65 Fitzroy Street, Surry Hills, the home of the bride’s parents, according to the rites of the Presbyterian Church, with George Preston as minister. Witnesses were the groom’s brother, Percy Cedric, and the bride’s sister, Julia McLean. He was thirty-three and she was twenty-three. Lilian Blanche McLean was a beautiful and dignified woman, as photos of her show. She was a good artist and several of her charcoal sketches of the female face survive. There is also her bible, a much-used book, inscribed with her name and address: Lily McLean, 65 Fitzroy Street, Surry Hills, NSW 1892. It is a great regret that we did not know this very beautiful woman, noted, said Ernest Broughton MLA for the “sweetness of her disposition and kindness of heart”, which “endeared her to all who had the privilege of her friendship”. 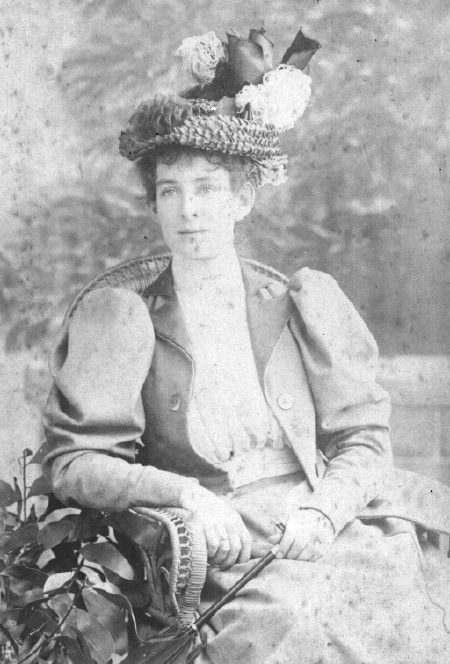 She died 20 February 1910, aged thirty-five, at Clanwilliam Street, Willoughby, of puerperal septicaemia, about twenty-five days after the birth of Percy Cedric. She was buried in the Waverley Cemetery, attended by the Presbyterian minister, John Macaulay, who was to attend her mother-in-law, Eliza Butler, seven years later. Their first child, Edward Malcolm, was born 18 October 1898 while the family was living at 99 William Street, Sydney. Edward William’s son Alexander was, more than likely, living with his mother in Melbourne. Their second child and only daughter, Julia Blanche, named after her mother’s family, was born 18 December 1899, the family still being at 99 William Street. 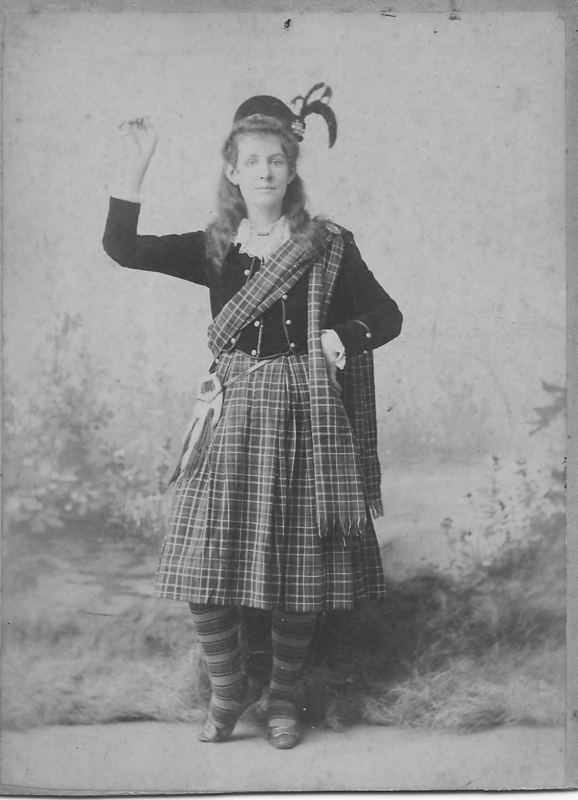 Julia Blanch was named for her mother’s mother, Julia McLean née Dedicoat (actually, née Day, but that story is told elsewhere) and her mother’s sister Blanche. The name Blanche is a curious coincidence in that it is a name strongly associated with the Butler branch of the family, though spelt Blanch. Edward William involved himself in civic affairs and while he never appears to be involved in Lawn Bowls as were his father and brother Percy, he was strongly involved in Australian Rules Football. As an estate agent in the William Street area he must have been close to the affairs of the Municipal Council at the Sydney Town Hall. Maybe there is evidence of his involvement in civic affairs in various records around the city, but the following snippets are all I have. John L Mullins writes, under the Sydney Municipal Council crest, 12 December 1900. In one of the first intervals of leisure after the recent triumph in which you have taken so active a part I am only too pleased to make my special acknowledgements for your very great kindness to me. You were good enough to sign my requisition as chairman over meetings, to urge my candidature in generous language, to increase the number of my supporters materially and finally in the eventful 7th inst. to arouse the apathetic to a sense of their privilege and thus secure a victory. I feel I owe everything to my friends whose confidence I hope to deserve by my share in the municipal proceedings of the next two years. With every good wish for Christmas believe me faithfully yours. And while the letter from Ernest Broughton MLA may have been a conventional expression of condolences to a prominent city man, it seems to ring more true than that, suggesting a personal respect for the bereaved husband as well as personal knowledge of the deceased. Edward William was obviously much involved in civic affairs and had become a Justice of the Peace in 1900. Their next child, Sydney William, was born 5 March 1904. By this time the estate agency was at 103 William Street on the north side between Crown and Palmer Streets. It was to move several times before it was settled there eventually in about 1927. The business was obviously carried on after Edward William’s death in 1928, as it is noted in the Sands Directories till the 1932-3 edition and in the Sydney Telephone Directory till November 1935. The huge sign, dark blue on white, was still there in the 1950s, obvious to anyone – including myself – travelling down William Street in those days. During this time, the older children, Edward and Julia, probably began their schooling at Plunkett Street, Woolloomooloo. Edward William himself was developing his interest in Australian Rules Football. His obituary describes him as “one of the pioneers of the Australian code of football in Sydney from Richmond, Victoria, in 1892 till a few months ago”. The obituary states that he was the founder of the East Sydney Club in 1903. When the time comes to write the history of how we won the national cause, the name of E.W. Butler will not be overlooked. A native of Australia, he has naturally a strong love for his country. His time and energies have always been on the side of “the flag with the six white stars”. An ex-player, he knows all the points of the game, and as secretary to the East Sydney Club and delegate to the New South Wales Football League, he has put in solid and lasting work on behalf of the national game. The photos and accompanying texts were obviously cut out of a book or magazine and pasted in the Minutes Book. Malcolm George, our father, was the next child born. The date was 27 December 1907 and the address 99 William Street. In 1909, Edward William is recorded at Albert Avenue, Chatswood. While his wife’s death certificate in 1910 has her living at Clanwilliam Street, Willoughby, Sands continues to record Edward William at Albert Street until 1913, when there is a move to é Avenue Darlinghurst. I have no knowledge of the time or circumstance of the Chatswood sojourn. He is, of course, still working in the estate agency, back again, since 1907 at 99 William Street. Percy Cedric, their last child, was born 25 January, 1910 probably at Clanwilliam Street. One month later the lovely beauty of Lilian Blanche faded from this world. Her husband was forty-six years of age with five children to look after, the last being but one month old. Lillian Blanche probably experience poor health in the last few years of her life. There is a touching postcard addressed to her at “The Retreat”, Mittagong, undated, but written between 1906 and 1910. It reads (in a reconstruction made by Ken Taylor) “Dear Mother, I received your two cards. I am going to Bourke Street School. I like it very much. . . . and Teddie were up . . . Sunday and they took me out to . . . Grandma said I was a good girl. With love to you and Siddnie. Julia.” Grandma is Julia McLean. The writing is reasonably mature and may indicate that Julia was about nine or ten years of age, which would date the card to about 1909 or early 1910. There is some pathos in this simple communication. Monday 23 April 2018 I made a call to the Mittagong Historical Society to see if I could find The Retreat where Lily Butler was some time from 1906 till 1907. I found nothing really substantial but the secretary gave me a little information about The Retreat. It seems to have been in Belmore Street (right, off Bong Bong Road) Mittagong. There were some other names associated with the place probably about 1906, but did not seem to relate to my story. There was no other information except that in 1909 it was a “Retreat” for gentlemen recuperating from certain issues! As I look again at the history, it seems that, because Jule’s undated card to her mother must have been before Malcolm George was born in 1907 because Jule says “With love to you and Siddnie”. Sidney was born 1904 and Sid was probably with Lilly at Mittagong. Presumably she returned to Sydney, became pregnant with Malcolm George in 1907. She gave birth to Percy in 1910 and died after his birth with puerperal septicaemia. It is not surprising that on 27 September 1911 Edward William remarried. His new bride was Mary Elizabeth Gavin, a demure woman in her younger photographs. Her loveliness was very Irish and very soft. They were married by Marist Father Jean Pierre Piquet at Saint Patrick’s, Church Hill. Father Piquet was a very prominent and popular priest at St Patrick’s at that time. The church had catered for the Irish community in its early years but its influence spread far beyond that community in later years. Though Edward William had no allegiance to the Catholic faith, Mary Elizabeth remained staunchly Catholic till the day she died. Her occupation was given as “booksower” [sic] and her age as forty. She was born in Sydney in 1871 and her parents’ names as they appear on the original wedding certificate, now in my possession, were Patrick Francis Gavin, labourer, of Clare, Ireland, and Bridget Gaffney. She was general called Mana. She was the woman my family knew as grandmother, and she was responsible for bringing up the children of the second marriage. Her step-daughter Julia took an instant dislike to her and went to live with her mother’s parents, Malcolm and Julia McLean at The Mall, 38 Maroubra Bay Road, Maroubra. The relationship between the two improved in later years. When I knew Mana she was living with her brother, Bede, at 83 Womerah Avenue, Darlinghurst. I always found her to be a lovely, warm, kind woman – my ideal of a grandmother. She was of the genteel poor, I always thought, and the house was out of a different era. In the musty old terrace house where Bede lived in an atmosphere of cigar smoke in the front room, I spent many happy hours of my childhood: her house was more peaceful than ours. I was proud to “take” her to Mass on Sundays at Saint Canice’s Church, Elizabeth Bay, and would return to her place for the comics and a real Sunday dinner – roast lamb, mint sauce (properly made), baked potatoes and boiled peas (shelled by hand), followed by apple pie (homemade, with a thick crust). The lounge room with its billiard table, which had been Uncle Ted’s (later donated to the Marist Brothers Juniorate at Mittagong) was a room of endless fascination for me: the photographs, the broken mantle-piece clock, drawers full of cue chalk and rubber stamps with the mysterious phrase like “Not Negotiable” (which no one could ever explain to me), a fine ewer and basin which my sister now has, and the silver tea service presented to E.W. Butler by the East Sydney Australian Rules Football Club, now in my brother’s possession. 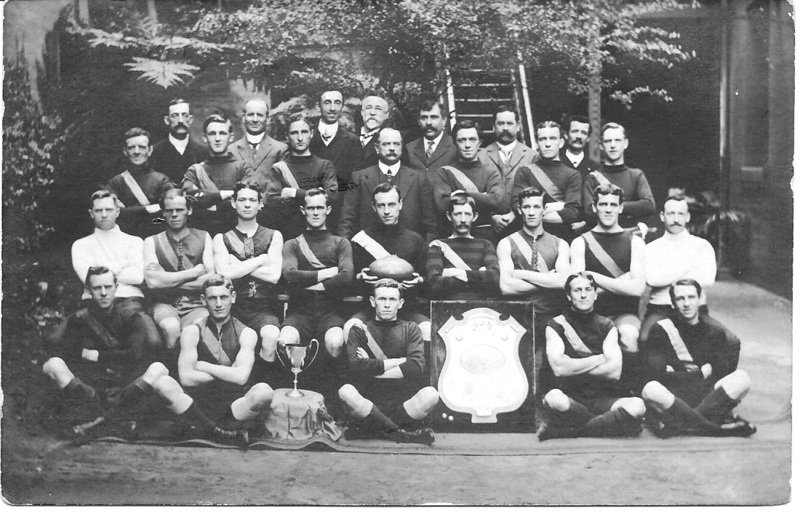 There were several pictures of EW Butler and his East Sydney Australian Rules Football Club, and a certificate of bravery awarded to my father for saving a lad from drowning at Rushcutters Bay. And a wind-up gramophone – which did not work. Many years later, in June 1980, Cardinal Sir James Freeman was to describe her to me in conversation as a very saintly woman. He had grown up in Womerah Avenue and knew the Butler family. He asked my whether I had converted to Catholicism and when I explained that my mother was a Catholic he said “Little Mackie Butler had no religion, but his mother was a saint.” What a world is contained in that statement. Mary Elizabeth died 25 May 1958. I was in the Marist Brothers novitiate at the time and not permitted to attend her funeral. Her brother, Bede Bartholomew, no relation of ours but fondly remembered, was born 6 February 1873. He was taught at the Marist Brothers School at Haymarket by Brother Casimir. There were two Marist Brothers at that time surnamed Gaffney – Brother Columba and the renowned Rugby Union coach Brother Henry. They were blood brothers. I wonder whether they were related to Bede, whose mother was Gaffney. Bede joined the Royal Australian Naval Brigade as a Leading Seaman in March 1893, served with the Second Contingent NSW Medical Corps in the Boer War from 17 January 1900 to 8 January 1901. In 1913 there was a move to 86 Womerah Avenue (ie, the eastern side of the street), and the estate agency was still at 99 William Street. The only fact I know about the next few years is that Edward William’s oldest boy, Ted, went to the War in 1916. He was, in the general opinion, “the finest of the Butler boys”, an upstanding, fine build of a man, from his photographs. 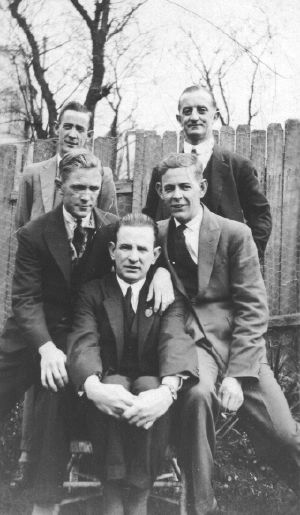 There are a number of photos of Ted and the other Butler boys at their father’s funeral in 1928. Ted is the most impressive looking of them all. One of the photographs shows Mary Elizabeth surrounded by the family, except for Julia who did not go to the funeral. Julia told me once she had that photo touched up with Mana removed and herself substituted: that was one of the many photos that disappeared at her death. Ted went to the First World War at the age of eighteen, much to his father’s regret, and Ted was “never the same again”. Originally I wrote “I don’t know what that meant, but talk of Ted was always tinged with regret and the note that his potential was never achieved. According to the back of a postcard, 3771, Pte. Edward M. Butler, C Company, 9th Rem., 19th Batt., A.I.E.F., 5th Inf. Brigade, sailed off to ‘Egypt or elsewhere’, 20 January 1916 on the Runic; ‘left wharf 8 a.m. left harbour 4 pm’. There are no photos of him in uniform, no mementoes of his service. There are several other photos of him, some at his father’s funeral, when his address was given as YMCA, Melbourne. He died a bachelor, 31 October 1938.” In more recent years my nephew Wayne Davey has done some more detailed research into Ted’s war service as well as that of Ted’s older brother Alex. This can be found at the end of this chapter – see Addendum: “Two Butler Men at War”. There are some medals; Wayne is trying to obtain them. There are two little mementos: a postcard from Aunty Bree (though it is possible the card is for his father) and a book. The card “A friend’s birthday Greeting”, reads “To Ted, With every good wish and Happiness on thy Birthday, from Bree”. (She was the wife of one of Mary Elizabeth’s brothers.) The book, “The King’s Servant” by Hesba Stretton, the Religious Tract Society, London, was inscribed: To Edward M. Butler, from Grandma, Xmas 1910. Which grandmother I do not know, but I would guess Grandma McLean who seems to have adopted the Presbyterian faith of her husband Malcolm, even though she was christened as a Catholic and brought up in the Catholic Orphanage at Parramatta (see The Day Girls). 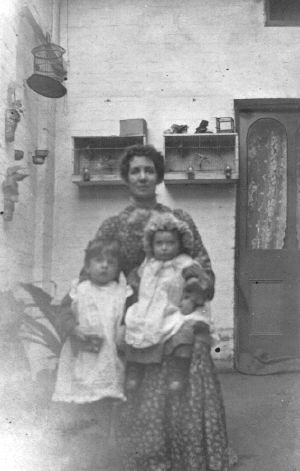 Edward William’s mother, Eliza (Helyar), died 7 September 1917 at Marrickville. The funeral party left from 86 Womerah Avenue. And so Edward William’s life seems to have gone on, centring on his interest in real estate, civic affairs and Australian Rules until his death in 1928. The Estate Agency moved several times: from 99 to 80 William Street between Riley and Crown Streets, and apart from a brief stay in 1930 at 102a William Street, it seems to have settled, in 1927, at 108 William Street, till 1935. In 1927, the year before he died, the family moved to 83 Womerah Avenue (on the western side of the street, a much nicer classical terrace house). The home passed into his son Sydney’s hands in 1929 and finally, in 1932, into Mary Elizabeth’s hands where it remained till she died in 1958. Edward William’s death occurred 8 August 1928 at Saint Vincent’s Private Hospital, of myocarditis. He was 64 years of age. He was cremated at Rookwood attended by a Church of England minister, J. Paul Dryland. His three marriages are detailed on his death certificate, and his six children, there being none from the third marriage. Edward William Butler remains a shadowy figure. There are only two personal comments about him that I can recall. His niece, Viwa Frend, described him as “such a happy man, always laughing and jolly”. His daughter described him as a proud man who was not willing to have his photograph taken with his second wife for fear she may outshine him. I wonder about several things: he lent money to a friend to establish a tobacco importing company (the building still stands at the other end of the Cutler Footway from Saint Vincent’s Hospital) and lost the money. His widow lived in what I thought were rather faded circumstances. I am left with the impression of a distant, rather haughty man, one who was a stranger to his children. In my childhood when people spoke of him it was of a man above them. I never heard my father talk about him, and my father’s way of parenting may have reflected a certain coldness or lack of affection in his own upbringing. He was too young to remember his mother who died when he was three. I make these assumptions at some risk. The funeral of Mr. EW Butler whose death occurred in St. Vincent’s Private Hospital on Wednesday morning took place at the crematorium, Rookwood Cemetery, yesterday morning. Mr. Butler was for 34 years engaged in business as an estate agent in William Street, City. In 1924 he stood as a reform candidate in the city Council elections. He also took a leading part in the Australian Natives’ Association. Mr. Butler was one of the pioneers of the Australian Code of football in Sydney, his active connection with it lasting from the time he came to Sydney from Richmond, Victoria in 1892, till a few months ago. The Rev. JP Dryland of St. John’s Rectory, Glebe, conducted the burial service. The principal mourners were Mrs. Mary Elizabeth Butler (widow) and Messrs. S., E., M., P. and A. Butler (sons) and Miss J. Butler (daughter). Others present included Mrs. J. E. West, M. E. West, M.P., H. S. Brown, G. H. Sanders, C. Miller, F. Hughes, D. F. Harrison, H. Mortimer*, D. Bennett, J. Bramble, W. F. Gibbons and M. Burke. The Australian Rules Football League was represented by the following: M. McWhinney, Jun., (Hon. Secretary), L. W. Percy (Hon. Treasurer) J. E. Phelan (past Hon. Sec.) on behalf of the Australian National Football Council, H. Chesney Harte (past Secretary), H.W. Smith and J. F. McNeil (past presidents), W.C.R. Ward (North Shore club), T. J. Hayes (Hon. Secretary Eastern Suburbs Club), W. Knott (Western Suburbs Club), J. Cross (captain, East Sydney Club which the deceased founded in 1903), A. McWhinney Sen. (Hon. Treasurer Eastern Suburbs Club) and S. Milton (vice-captain, Eastern Suburbs Club). Wreaths were forwarded by the New South Wales Australian Rules Football League and the Eastern Suburbs and Newtown Clubs. Edward William’s sons after his funeral: Sidney and Alex, Malcolm and Percy, Ted. While Miss J. Butler was listed among the principal mourners, I am sure she told me she did not attend the funeral – she may have said the mourning gathering afterwards at 83 Womerah Avenue. 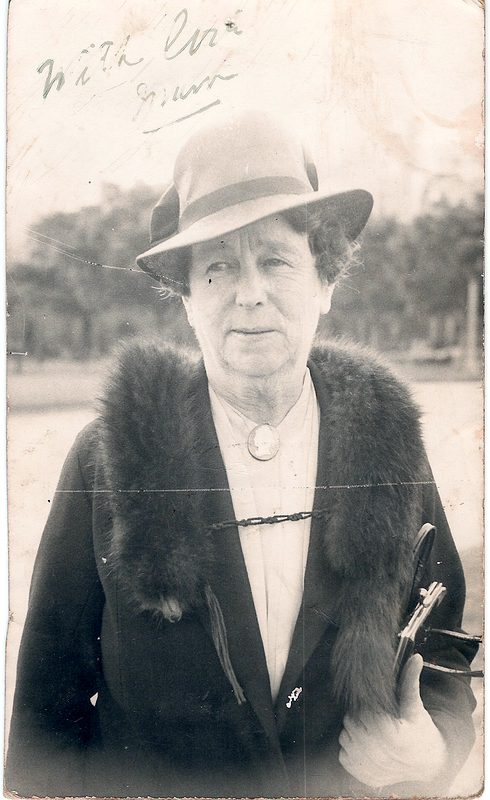 Julia Blanche is responsible for much of the first-hand Butler and McLean material in this history. She was a woman of real wit and charm, a born entertainer and a story-teller unmatched: she fancied she had the sixth sense. She it was who suspected the connection between the convict-bushranger Bill Day and her great- grandfather William Dedicoat. Her suspicion proved true: they were the same man, and she would have revelled in the detective work which went into proving it. But she died too early to realise it. She was born in Sydney 18 December 1899 at 99 William Street where she lived till her mother died when Jule was ten years old. She attended the Plunkett Street Public School for several years. When her father re-married she went to live with her grandparents. I recall she spoke of the Bourke Street Public School, so she probably lived in Bourke Street with them while her grandfather McLean was still involved in the Cordial Factory in Fitzroy Street, Surrey Hills, before moving to Maroubra. She talked a lot more about her grandparents, but I listened too little and did not know what I know now. They left their mark on her in many ways, particularly her Scottish grandfather. He was a religious man, a Presbyterian; his wife probably adopted his ways, for her own father described himself as a Ranter, her mother was baptised a Catholic, and her brother and sisters were christened by anyone who happened along. Jule herself subscribed the Church of England but never attended. It was grandfather McLean who gave her the works of Shakespeare for her birthday: “18th December 1912, To Julia B. Butler on her 13th Birthday from Granpa”. Jule has inked in a “d” making it “Grandpa”. 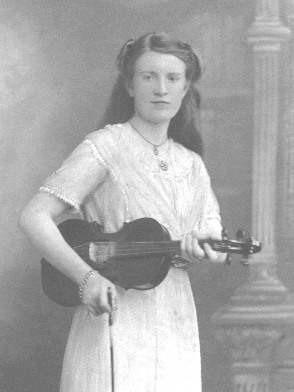 The Shakespeare hints at the actor in Jule: she had a fund of stories and poems and songs; she would play the piano – well, she could “vamp”, as she called it, and we loved to ask her; and she was a violinist in her younger days. We used to love her story of “Old Mose and the Eggs”. In her recitation of Kipling’s “Green Eyed Yellow Idol”, the floor was wet and slippery where she stood, and the vengeance of the little yellow god got me every time. Then she would sing “The Owl and the Pussycat” and “P.C. Forty-Nine”. If we were good, she would vamp a little more, then recite “The Cow Stood in the Meadow” letting fall a pack of cards for sound effects. She had been, in the 1930s, a member of the Viking Club which organised dances, picnics and hikes: a splendid audience for her talents. She was, too, a legal secretary and worked for Kenneth J Tribe for many years. On March 8 1952 she married Charles Thomas Blake at the Wesley chapel in Sydney: my mother and sister attended the wedding which was a private affair and came as complete surprise to me. Charles was a widower and she had loved him for many years since she had met him while working for the Pigment Company. His daughters Adeline and Johanna and their husbands happily adopted Jule and loved her. They took great care of her when Charles died, after just ten years of marriage, 20 March 1962. Sydney William, the third child, was born 5 March 1904, married Iris Roberts and died without any children, 14January 1958. I may have met both Sydney and Percy once at 83 Womeral Avenue, but my recollection is not certain. The last child, Percy Cedric, was born 25th January 1910. His mother died about a month after his birth. He married Mabel Tompkins and they had one child, Malcolm. I had lunch with Malcolm in 1961, but have never seen him since, though we re-established contact in 2014. His wife’s name was Judith; there was one child, Lisa. Malcolm and Lisa divorced. Percy died 19 August 1969. 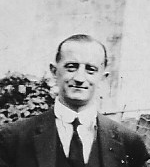 Our father, Malcolm George, was the fourth child of Edward William and Lily Butler. He was born 27th December 1907 at 99 William Street. He could not have really known his mother who died when he was just three years old. His father soon married the woman who was to bring up his children. Malcolm’s earliest years were spent in William Street and Clanalpine Street but in 1913 the family moved to 86 Womerah Avenue and Malcolm went to school at Westbush, the State School on the corner of Liverpool Street and Womerah Avenue. He went only as far as the Qualifying Certificate, which was gained in Sixth or Seventh Grade. There is one known highlight of his youth: an award for bravery. The Royal Shipwreck Relief and Humane Society of NSW, 8 January 1923, awarded a fine certificate inscribed with his name, to “Malcolm G. Butler aged 14 1/2 years for his bravery in saving the life of William Johnson from drowning in Rushcutters Bay, Sydney Harbor (sic) on the 18th July 1922”. Malcolm George never spoke of his father to my knowledge which is why I assume Mr. Butler was a distant man. And while Mary Elizabeth was a devoted step-mother, her own religious values certainly did not rub off onto the children. Cardinal Sir James Freeman, who grew up in Womerah Avenue at the same time as my father, put it accurately if bluntly: “Little Mackie Butler had no religion”. Mac, or Maxie as he was commonly known, was apprenticed as a French Polisher at Bray and Holliday’s (Show Case and Shop Front) Pty Ltd of McLachlan Avenue, Ruchcutters Bay, where he remained for most of his working life, with a few breaks till he lost his job in the mid-‘Fifties. He lived at 83 Womerah Avenue with his mother and brothers after his father died in 1928, until he married Honor Whittaker in 1936. That story is the final chapter in this history. During 2008 my nephew Wayne Davey did some research among the papers from the Australian War Museum and found details of the War Service of two Butler boys, the oldest, Alexander Edward, son of EW Butler and Jessie Hilda Burke, and EW Butler’s second son Edward Malcolm, the first child of his marriage with Lilian Blanche McLean. In 1886 Edward William Butler married Jessie Hilda Burke in Melbourne – at least, my aunt told me that. However, on the certificate of his marriage to Lily McLean, Edward William is recorded as “bachelor”. There was one son, Alexander Edward, named after his grandfather Alexander Edward Butler, and he died a bachelor 29 January 1964. He was a Gallipoli veteran. In looking up ancestry.com for Alexander Edward Butler’s war records, I picked up the following: born 1888, Richmond, Melbourne “natural born” (does this mean, as it did in the 19th century, illegitimate?) He was an electrician and joined the 13th battalion 16.11.14 aged 26. The 13th Battalion AIF was raised from late September 1914, six weeks after the outbreak of the First World War. The battalion was recruited in New South Wales and, with the 14th, 15th and 16th Battalions, formed the 4th Brigade, commanded by Colonel John Monash. The Brigade embarked for overseas in late December. After a brief stop in Albany, Western Australia, it proceeded to Egypt, arriving in early February 1915. Australia already had an AIF division there, the 1st. When the 4th Brigade arrived in Egypt it became part of the New Zealand and Australian Division. The 4th Brigade landed at ANZAC Cove late in the afternoon of 25 April 1915. On the 2nd May 1915 Alexander Edward Butler was wounded and was evacuated to Egypt with lacerated fingers but returned to Gallipoli several weeks later. From May to August, the battalion was heavily involved in establishing and defending the ANZAC front line. In August, the 4th Brigade attacked Hill 971. The hill was taken at great cost, although Turkish reinforcements forced the Australians to withdraw. The 13th also suffered casualties during the attack on Hill 60 on 27 August. The battalion served at ANZAC until the evacuation in December 1915. After the withdrawal from Gallipoli, the battalion returned to Egypt and on 15th Feb 1916 Alexander was promoted to lance corporal. While in Egypt the AIF was expanded and was reorganised. The 13th Battalion was split and provided experienced soldiers for the 45th Battalion. The 4th Brigade was combined with the 12th and 13th Brigades to form the 4th Australian Division. Battle Honours: Landing at Anzac, Anzac, Defence of Anzac, Suvla, Sari Bair, Gallipoli 1915. The 45th Battalion AIF (New South Wales) [12th Infantry Brigade] was formed Egypt 4 March 1916 from 2 companies of the 13th Battalion AIF. The 45th Battalion was raised in Egypt on 2 March 1916 as part of the “doubling” of the AIF. Approximately half of its new recruits were Gallipoli veterans from the 13th Battalion, and the other half, fresh reinforcements from Australia. On 3rd March Alexander was transferred to the 45th battalion. Reflecting the composition of the 13th, the new battalion was composed mostly of men from New South Wales. On 25th March 1916 Alexander was promoted to full corporal. As part of the 12th Brigade of the 4th Australian Division, the 45th Battalion arrived in France on 8 June 1916, destined for the Western Front. On 22nd July 1916 Alexander was hospitalized in France and transferred to England 9th August 1916 with bronchitis. The 45th Battalion fought in its first major battle at Pozières in August, defending ground previously captured by the 2nd Australian Division. Alexander contracted mumps 21st December 1916. After Pozières the battalion spent the period until March 1917 alternating between duty in the trenches and training and rest behind the lines, first around Ypres in Belgium, and then in the Somme Valley in France. The 45th Battalion was in reserve for the 4th Division’s first major action of 1917 – the first battle of Bullecourt – and was not committed to the attack. It was, however, heavily engaged during the battle of Messines in June, and suffered commensurate casualties. Alexander was discharged from the AIF on 13th July 1917. Like most AIF battalions, the 45th rotated in and out of the front line throughout the winter of 1917–18. In the spring of 1918 it played a crucial role in turning the last great German offensive of the war when it defeated attacks aimed at breaking through the British front around Dernancourt. The Allies launched their own offensive on 8 August with the battle of Amiens. On the first day of this battle the 45th Battalion captured 400 German prisoners, 30 artillery pieces and 18 machine guns. 8 August became known as the “black day of the German Army” and initiated a retreat back to the formidable defensive barrier known as the Hindenburg Line. The 45th Battalion fought its last major action of the war on 18 September 1918 around Le Verguier to seize the “outpost line” that guarded the approaches to the main defences. The battalion was out of the line when the war ended on 11 November, and was disbanded on 2 May 1919. Battle Honours: Egypt 1916, Somme 1916-18, Pozieres, Bullecourt, Messines 1917, Ypres 1917, Menin Road, Polygon Wood, Passchendaele, Arras 1918, Ancre 1918, Amiens, Albert 1918, St Quentin Canal, Hindenburg Line, Epehy, France and Flanders 1916-18. 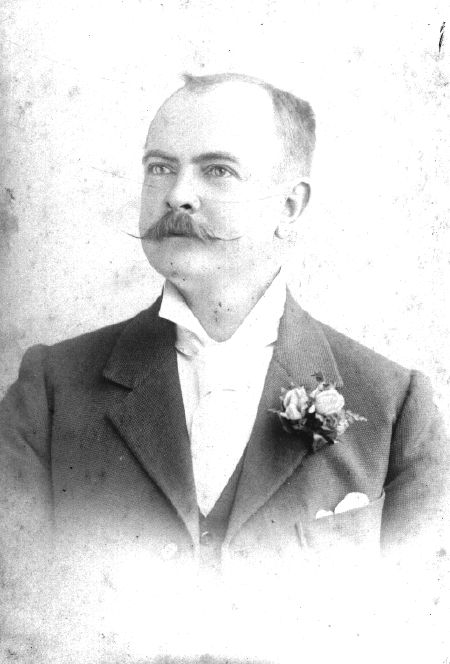 In 1893 Alexander Edward Butler senior moved to Sydney with his sons Edward, Hubert and Percy. In 1897 Edward William set up as a house agent at 99 William Street and in that same year remarried, 29th December 1897; he was 33 and his new wife, Lilian Blanche McLean was 23. Ted went to the First World War at the age of eighteen, much to his father’s regret, and was the family said he was “never the same again”. In my original account of the family, I wrote: “I don’t know what that meant, but talk of Ted was always marked with regret and the suggestion that his potential was never achieved. According to the back of a postcard, ‘3771, Pte. Edward M. Butler, C Company, 9th Rem., 19th Batt., A.I.E.F., 5th Inf. Brigade’, sailed off to ‘Egypt or elsewhere’ 20 January 1916 on the Runic; ‘left wharf 8 a.m. left harbour 4 pm.’ There are no photos of him in uniform, no memoirs of his service.” Thanks to Wayne’s research, we can now read of his military service. At the time of his father’s funeral (8 August 1928), his address was given as YMCA Melbourne. He died a bachelor, 31 October 1938. Hazel eyes, fair hair, 5’8 tall. First posted as the 9th reinforcements to the 19th Battalion but shortly after arriving in Egypt he was transferred to the 55th Battalion on the 3rd April 1916. The 55th Battalion AIF (New South Wales) [14th Infantry Brigade] was formed Egypt 14 February 1916 from the 3rd Battalion AIF. Arriving in France on 30 June 1916, the battalion entered the frontline trenches for the first time on 12 July and fought its first major battle at Fromelles a week later. The battle was a disaster, resulting in heavy casualties across the division. Although in reserve, the 55th was quickly committed to the attack and eventually played a critical role, forming the rearguard for the 14th Brigade’s withdrawal. Despite its grievous losses the 5th Division continued to man the front in the Fromelles sector for a further two months. On 7th July he was charged with absent without leave (AWL) from a tattoo (military) and fined 1 day’s pay. On 21st July 1917 he was transferred to Australia and was eventually discharged from the AIF on 7th Feb 1918 as medically unfit from Holsworthy Army Base NSW. Edward later received the British War Medal, number 32702 and the Victory Medal number 32295. He applied for and was granted a war pension of 1 pound 10 shillings a fortnight from 8th Feb 1918. [What follows is an account of the battalion’s service for the remainder of the war.] Later in the year, the AIF’s focus of operations switched to the Ypres sector in Belgium. The 55th’s major battle here was at Polygon Wood on 26 September. With the collapse of Russia in October 1917, a major German offensive on the Western Front was expected in early 1918. This came in late March and the 5th Division moved to defend the sector around Corbie. The 14th Brigade took up positions to the north of Villers-Bretonneux and held these even when the village fell, threatening their flanks. Once the German offensive had been defeated, the Allies launched their own offensive in August 1918. The 14th Brigade did not play a major role in these operations until late in the month, but its actions were critical to the capture of Péronne, which fell on 2 September. The 54th fought its last major battle of the war, St Quentin Canal, between 29 September and 2 October 1918. For his valour during this action Private John Ryan was awarded the Victoria Cross. Battle Honours: Egypt 1916, Somme 1916-18, Bullecourt, Ypres 1917, Menin Road, Polygon Wood, Passchendaele, Ancre 1918, Villers-Bretonneux, Amiens, Albert 1918, Mont St Quentin, Hindenburg Line, St Quentin Canal, France and Flanders 1916-18. I never knew my uncles, even though Alex was still living until I was 24. One can only regret not knowing either these men or their stories. I am grateful that my nephew has taken the time to find out more about them.